One of the most important things that you can develop in your life, and in your relationship, is your resilience – the way that you bounce back from the challenges that life throws your way. How do you recover in a way that leaves you even stronger, more connected, more inspired than before? 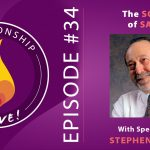 In today’s episode, we’re talking with Dr. Peter Levine, creator of Somatic Experiencing, author of the bestseller Waking the Tiger: Healing Trauma, and co-author, with Maggie Kline, of Trauma-Proofing Your Kids. 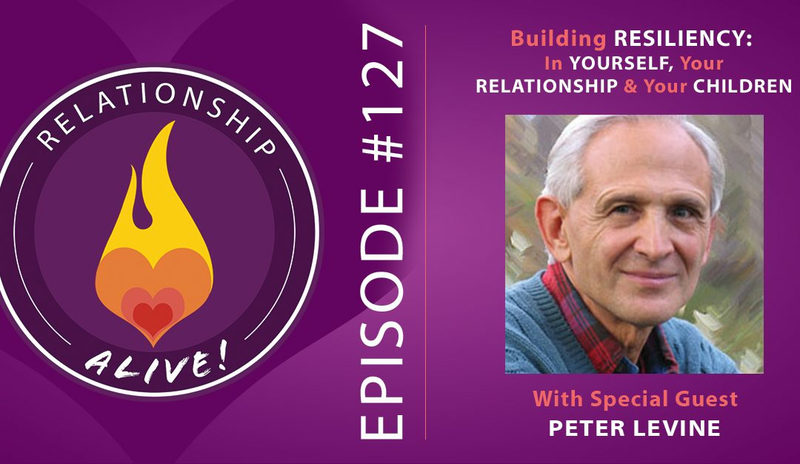 Peter and I explore exactly how to build your own resiliency – and how to also help your partner, and your kids become more resilient. Neil Sattin: Hello and welcome to another episode of Relationship Alive. This is your host, Neil Sattin. How do you foster resiliency in yourself and in your partner and if you have kids, in your kids? When it comes to relationship and how we are in the world, there’s perhaps nothing as important as how resilient we are because let’s face it. Life sometimes sends problems our way or things that are challenging. And if you’re expecting everything to be a cakewalk, then life is going to be really hard for you. Neil Sattin: On the flip side, if when things go wrong, you think, “Oh, my goodness, it’s over now,” then things are also going to be hard for you. In order to get through anything that happens to you and come out the other side stronger and more vibrant and to bring that same quality into your relationship and to bring that same quality to, if you have kids in your life, the way that they respond to the world. That is what we are going to talk about today. 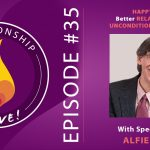 Neil Sattin: In order to do so, we have brought back one of our most esteemed guests to the Relationship Alive podcast. His name is Dr. Peter Levine, and he is one of the world’s experts on how to heal from trauma. 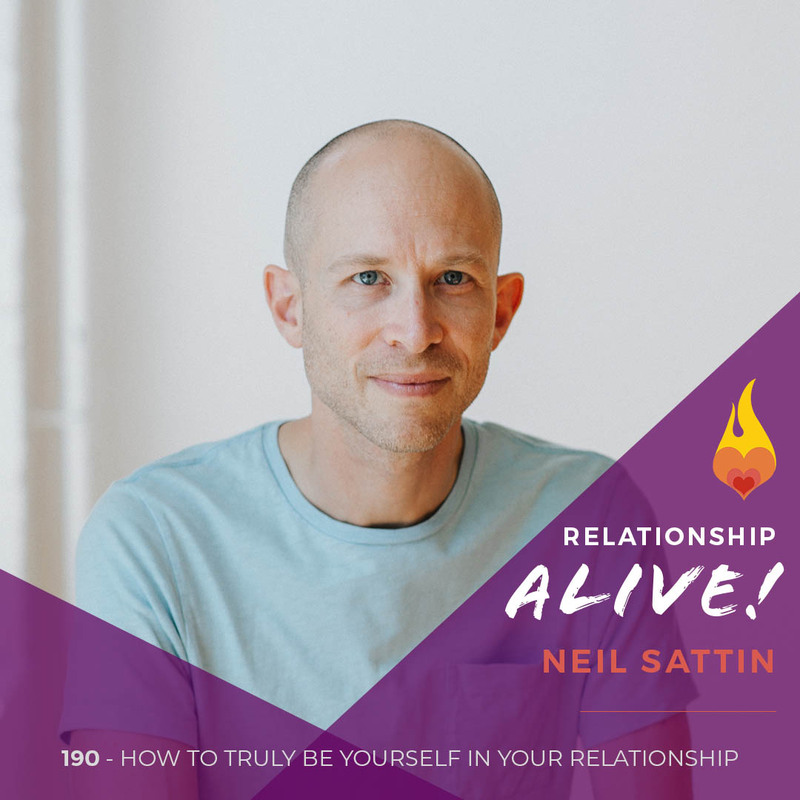 He was first on the show back in Episode 29 and if you’re interested in checking that out, you can go to http://www.neilsattin.com/trauma and you can hear all about how to heal your triggers and trauma in relationship. Neil Sattin: We’re not going to cover much of that material. We’re going to try to cover new ground here. I invite you to listen to Episode 29. In the meantime, it’s not a prerequisite for today’s conversation and we are going to dive deep on the topic of resiliency. If you want a transcript and guide for this episode, you can visit http://www.neilsattin.com/levine as in Peter Levine and that’s spelled L-E-V-I-N-E or you can text the word “passion” to the number 33444 and follow the instructions and I will send you a link where you can download that show guide and transcript. Neil Sattin: In the meantime, Peter Levine, thank you so much for joining us today. It’s great to have you back here on Relationship Alive. Peter Levine: Thank you. It’s good to be back. I enjoyed the last time. 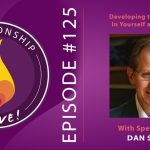 Neil Sattin: Well, it’s always exciting to be able to chat with you and you are someone who has been on the forefront of figuring out how we heal the things that keep us stuck. And there’s nothing that I think defines resilience more than the ability to get unstuck when you’re going through something. Peter Levine: Indeed, I like that. I think that’s right on it. It’s about when we get stuck, somehow knowing we can handle it because of an inner sense in our bodies, in our organism and that we can also receive and give support at times that are really challenging. Neil Sattin: Yeah. I’m inspired by in your book, Trauma and Memory: Brain and Body in a Search for the Living Past, which I happen to have here right in front me. You talked about this location in the brain where resides our capacity for wanting to persevere through adversity. Peter Levine: If you think about it, it makes sense because we wouldn’t be able to survive as a species if we didn’t have that capacity. I don’t say it’s the same as resilience but it’s a big important component of resilience. In working with people who have been traumatized for 45 years, and I think back on it, I think really my job is to help them enlist that capacity, connect to that capacity and by doing that being able to move forward in difficult times. But I think they’re very closely related, this will to persevere and resilience. Peter Levine: I also see resilience as an autonomic exercise and what I mean by that is when we’re in states of fear, our autonomic nervous system gets activated in particular ways and that really affects our whole perception of the world and our cognition really because it’s strong … But it’s a foundation for many perceptions. And if we’re able to experience ourselves, for example, our heart rate increasing and then experiencing it decreasing, we’re doing an autonomic exercise. Peter Levine: This is something that couples can do with each other by just being present when one of the members is feeling frightened. “It’s okay, and so what happens now and what happens next? And is there anything about that? Is there anything else about that?” To be there with the person, to help them move through the stuck places is a great gift and I really believe that in one way or another, most, maybe even all successful couples have some degree of this capacity. Neil Sattin: Yeah, and in the interest of increasing that and maybe even getting a little bit more detail about what you were just mentioning, I’m thinking now because as I mentioned before we jumped on the interview, I just read your amazing book, Trauma-Proofing Your Kids: A Parents’ Guide for Instilling Confidence, Joy and Resilience. One of the things that I loved about the book was not only feeling way more resourced in terms of how I show up for my own children but also you stressed the importance for parents of being able to understand the language of the body so that you can have those communications with your children and help them understand the language of the body. Neil Sattin: But one thing I’d love for you to talk about is how there’s this way of communicating about sensation that is how these deeper parts of our brain actually perceive the world that’s not about … Because I think the temptation, if I were sitting with my partner would be, if I were saying “what’s next” and “what happens next” we would be caught in these zoo of thoughts and feelings. I love bringing it down to the deeper level of sensations. Can you talk a little bit about that and why it’s so important to develop a vocabulary around sensation in your body? Peter Levine: Because one of the things about difficult emotions – called negative emotions – is they just have a tendency to keep going and keep going as much as we can understand them or understand our thoughts about them. Really, it’s difficult to change them and I really believe my experience is that again, the way that we can change the … One of the ways that we can change these difficult emotions is by the alchemy of working with these sensations, the underlying sensations and also sensations of goodness. Peter Levine: In my major book, In An Unspoken Voice: How the Body Releases Trauma and Restores Goodness, the key is in both. And restoring goodness also is a sensation, a feeling of felt sensation of resilience. When I say goodness, I don’t mean like a good child, a good spouse, a good so forth and so on. I mean, more of the Buddhistic understanding of goodness – that it’s a feeling of wholeness and a feeling like this, like wholeness, are some of the most important antidotes again for these difficult emotions and sensations, that allow us to move through them because we have this innate capacity to heal. Peter Levine: Originally, I studied this in animals and how they rebound in the aftermath of prey animals and predation but it’s led me to a more general understanding that there is this profound instinct similar to the instinct to persevere – they’re related, I’m sure, to heal – that we yearn healing. And in a way, in relationships, I’m sure as you and many of your speakers have noted that we tend to pick people with similar traumas or complementary traumas. 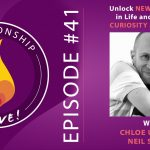 At first, we’re very much in love, which is often the first phase of a relationship, but then what happens when the stuff hits the fan, how do we deal with that in a collaborative way, in a corrective way? Peter Levine: Again, this is so important in restoring resilience because co-regulation is tremendously important. I’m looking forward to it and later this month, there’s a big Evolution of Psychology conference in Anaheim and I’m on a panel with Sue Johnson. I think you’ve interviewed Sue and if any of your readers don’t know, Sue is the leading person in understanding the emotions that go on in couples’ dynamics and really has a strong emphasis on co-regulation. Peter Levine: What I’m saying is that we need both co-regulation, of course, but we also need the tools for our own regulation, for our own building of resilience. I see the two blending together very nicely. Peter Levine: We’re talking about with our children. By learning to read their bodies and helping them connect with their sensations, we are building a tremendous reservoir of resilience that they will add skills that they will carry for their whole lives. Again, one of the things that as parents that we need to be able to do is when there’s … In the inevitable fall or God knows the ride to the emergency room, we need first to take care of our own sensations and emotions because children are incredible mimickers. They will pick up the emotion of the parent. Peter Levine: You know, anybody who’s flown in an airplane in the last 25 years, what do they call them? The cabin personnel, they make the announcement that in the unlikely event of depressurization, the oxygen mask will come down. If you have a child or somebody infirm next to you, put the mask on your face first and then put the mask on the child. In other words, calm yourself first so that the children are not picking up the fear. Or very often, the parents override the fear with anger and they’re very angry at the child. Again, children will pick this up. Peter Levine: If we learn to take care of ourselves, self-regulation, we then can impart that capacity or support that developing capacity in our kids. When I work with kids when there’s been a relatively acute trauma, sometimes, it just takes a few minutes of play and they go right to the place where they are stuck in their bodies. I just help them move through that and then, they’re off back to play again. Peter Levine: These tools are tremendously important and probably a quarter of the book or the eighth of the book, I guess, probably is about exercises to help the parents maintain this resilience in the face of the catastrophes that will befall the children and the parents. It’s a given. Kids, especially when they get into the more active phase around 18 months, 2 years where they’re just scooting everywhere and climbing and falling and pulling flower pots down on their sweet little heads. They get terrified but again, if we hold our own center and then help the child contain those difficult emotions and sensations, they will calm often surprisingly quickly, sometimes in a matter of minutes. Peter Levine: The way you support children, it’s age-dependent. The way you support a baby who’s tremendously upset is way different than the way you support a four-year-old. With a young child, you’re going to be holding the child and rocking the child. With the four-year-old, you’re going to sitting by child’s side and maybe placing your hand as we suggest in the book, on the child’s back until the breathing reestablished itself, the spontaneous breathing reestablished itself. Peter Levine: The amazing thing, I think, the side effect of this is that kids start doing it for themselves and many of the children that I’ve worked tell me how they’ve done it in their school when something happens to one of the students. They sit there and they’re with the student in that way. Actually, when I was designing the cover of the book with North Atlantic, I wanted it to be red. It has a picture of children in the middle. This is not red, but the rest of the cover is red and the idea, please forgive me, is Mao Zedong and the way he wanted the red book, well, he insisted that the red book be in the hands of everybody in China that had his sayings. Peter Levine: The idea here is that every parent could have this book and could share it with other parents. One of the things that I think geopolitically is that when we’re in a fearful state, any leader, and we’ve had ample evidence of this, who says there’s an enemy out there. They want to attack us. They want to humiliate us. They want to take our jobs away and I am the only person that can protect you. No names mentioned. Peter Levine: That’s going to grab a lot of people. But if you’re not in a fearful state, then you don’t buy into that. You really think about it. I’m hoping also that this book in the next generation will give us more citizens, more democratic citizens allowed to or what’s the word I’m looking for? Empowered, really, to make effective action. Neil Sattin: Yeah, as I was reading the book for one thing, and actually this brings me to a question because I was reading it and I was, of course, thinking, “Wow, I wish I had read this before my kids were born.” I want to fill in a gap or two but perhaps before we do that, I’m just going to ask you this question which is, let’s say, my son. He’s going to turn 11 in a couple of months, but there are things that I remember having happened with him. When he was two and tumbled down the stairs or three or four years ago, he jumped off a swing set and ended up breaking his arm. These are some traumatic events in his life. I’m wondering, and this is obviously going to have some bearing for adults as well. How do I know if those things are lodged within him as trauma? And if so, what’s a way to invite him into releasing that? Peter Levine: And sometimes, we’re sitting around. We’ll say something like … Maybe even if we’re at the top of stairs or something like that and I would just maybe sit down with the child and saying, “Gosh, I remember when you fell down these stairs when you were two years old. Do you remember anything about that?” If the child very quickly says no, then you have a good indication there’s something there. Or, if they say yes, if they reflect and then say yes, then it’s an opportunity, really a wonderful opportunity to explore that. Peter Levine: What I sometimes will do is, for example, if the child was falling, I’ll hold the child or put my hand on the back of the child and hold the child and let them fall into my hand gradually and then to see what happens as they have this controlled fall. Because again, you have your hands, they’re not going to fall. But they have the feeling, the sensations of falling. That may bring up images or sensations that were associated with the earlier event when they tumble down a flight. I guess, it was a flight of stairs. I think that was just an assumption I made. Peter Levine: In games, in play, in just talking, 11-year-old, you were able to say again, “Remember, a couple of year …” When was it that happened, a couple of years ago? Neil Sattin: Well, that and the stairs, that was a long time ago, but I know he remembers it because it’s come up before in conversation. Peter Levine: Well, I would again make a game at it with a falling game. Sometimes, I’ll do it just holding them with my hands, letting them slowly fall backwards, for example, or forward. You can do either one, and then I’ll put a really big, super big pillow or combination of pillows and then they can begin to … I’ll let them down part way and see if they want to play the game where you release them and they fall into the pillows. Peter Levine: At first, there may be some fear. You might see it in their eyes or their heartbeat might increase. They might tense a little bit, but you see when you continue with this controlled falling and they’re falling into the soft cushions, the kids love it. And very often, it’s something simple like that which is all that’s needed. Something simple like that. Neil Sattin: Where would it come in, for instance, just using my son as an example. Let’s play a game. Let’s do this thing, and let’s say I notice something in him, where would it come into ask him or to invite him to name the qualities of sensation that he’s feeling within him? Peter Levine: Well, again, if you talk to him, “I wonder if you remember the tumble you took down the stairs when you were really little, when you were about two years old.” If the child says yes, then the sensations are going to be right there. If they’re not remembering it, you can say, “Well, when you just even think about that, think about how it might have been for you. Is there any place in your body that you can actually feel that?” Again, most children will point to some part of their body. Peter Levine: Then, you take it to the next step. “Okay, and you feel that sensation. Does it have a shape? Does it have a size? Does it have a color? What does it feel like?” And so forth. You start asking these what I call open-ended questions. Neil Sattin: What is it about naming those sensations that’s so important? Peter Levine: Well, of course, the most important thing, of course, is feeling the sensations, being in contact with the sensations. But naming them is also important, because that’s a way that the child can reference them in the future. It’s kind of like a flag attached to the sensation. “Okay, this sensation has a name. The next time I have this sensation, I have a name and when I have the name, I can also notice the sensation.” You’re shifting back and forth. Neil Sattin: Yeah, and that reminds me of how important it is for all of us really to have the experience of moving through – which is part of what contributes to resiliency – is knowing that the pendulum swings the other way. Peter Levine: That’s right. Yeah, I call that pendulation, because no matter what we’re feeling … What we tend to do when there’s been a difficult sensation is we recoil from it. We try to push it away and by pushing it away, it actually makes it seem stronger. That which we resist persists. If you have a sensation that’s coming up, imagine your hand moving upwards and your hand is in a fist, your arm moving upwards and you take the other hand and you put it over that hand that wants to move up. Well, then it’s going to push harder against your upper hand and then your upper hand is going to push harder against it. It then seems like this is going to be overwhelming and we lose resilience. Peter Levine: However, when we’re able to experience the sensation and that it moves through, that it increases and it decreases, that it contracts and it expands. It contracts and expands and expands and expands. This is the expansion, which I talked about when I say goodness or wholeness. Again, I think it’s very deeply related to resilience. I think we’re talking about many, many, many of these different states and processes that increase a resilience. Peter Levine: I’m sorry, to which sensation? The sensation of? Neil Sattin: To all of those, I guess, like those things that are happening in your body. Like one, just like you were saying earlier, when you feel those states again, it can remind you like, “Oh, I’ve been here before,” and “I know what’s going on” so there’s that. But then, there’s also … And you talk about this in terms of pendulation, if you can get acquainted with the sensations of goodness and what that feels like in your body as well. Peter Levine: When you experience goodness, it stays with you and it really helps you get that whatever you’re feeling, whatever the sensations are, they will change. But the bigger reservoir of goodness we have, the more resilient. A study was done, oh, gosh, I don’t remember by whom or when. I think Bessel told me about it, Bessel van der Kolk, that if a person, a child has had tremendous trauma in their lives, neglect and abuse, that child will actually fare okay – in other words, you’ll be able to work with that person – if one adult in their lives has cared about them and loved them unconditionally. Peter Levine: In a way, that’s amazing. Again, I think that’s something that contributes to that reservoir of goodness and resilience that somebody really reflected our feelings and our states and imparted upon us that gift of being seen, of being known, of being cared for, of being loved. It’s very important. Peter Levine: Hopefully, it’s a given between a parent and a child. But I think that just being sufficiently centered and caring can catalyze healing. I don’t think there’s any question about that. I think it’s really important that couples sort of work out a ritual of sorts where if one person needs something, that they can communicate that. And then the other person, their job is to try to be there for that person. And it should be relatively equal. Each person should have a relative number of things. Peter Levine: Although, particularly, I’m thinking about couples where one of the spouses is coming back from Afghanistan or Iraq. They’re very, very traumatized and it’s very likely, and hopefully that their spouse, their partner is going to be able to be there for them in those difficult times. I can’t tell you how healing that is. It’s not easy because a lot of times, because of the fear, the spouse becomes like the enemy. It’s almost like you’re expecting them to throw a hand grenade at you. So, it’s tricky. Peter Levine: If people want, they can go to … It’s on YouTube, and it’s called Ray’s Story, Peter Levine’s Somatic Experiencing, where I work with a young marine who was blown up by two of these IEDs and then lost … I think his best friend died in his arms just before that, and how we worked with the shock of that. And then, how we worked together with he and his wife and their new child. And at that time, it was really helping her develop the skills to be with him and to not pursue him when he really needed to withdraw. Peter Levine: I think it’s a short documentary. It’s about 20 minutes. I recommend looking at it because it really talks a lot about this. Because when you’re highly traumatized, your resilience is very, very low and vice versa when your resilience is higher, the trauma has less of a corrosive effect. But then again, I think it’s also important that there’d be some kind of equality that … I guess I’m saying that one person doesn’t become the therapist for the other person, that there’s reciprocity – which you have to have in a relationship, of course. Peter Levine: Absolutely. Again, the idea of making a ritual out of it and because of pendulation, no matter what we’re feeling, it may transiently … It may temporarily feel worse but if you’re able to stay with it and maintain an observing presence, it will shift. And often, this observing presence is fostered by the support that we get from our partners. Neil Sattin: Yeah. Can we talk for a moment about what that looks like? Because I think there’s a danger in being the witness whether it’s with your partner or with your kids of maybe intervening too soon. What does that process actually look like where something stuck gets resolved? Peter Levine: Well, let’s just say it’s a heterosexual couple. The husband comes in and he’s had a difficult day at work. It’s not a trauma per se, but he failed to get a promotion. The person got the promotion who he felt didn’t deserve it, and he’s really angry. And he comes home, and there were toys gathered all over the floor, no different than any other day when he would be returning home. He’s angry, and he yells at the kids, “Dammit, pick these toys up! You always leave toys in the middle of the room,” something like that. Peter Levine: Let’s say the spouse is able to maintain her center and then she can approach her husband and say, “Yeah, it seems like something is upsetting you. And I’d like to just offer myself of just being here so that you can feel what you’re feeling.” But again, this has to be a pre-agreed upon ritual that you give the permission. You empower the other person to do this for you. Again, because when you’re angry, sometimes the tendency is to snap at the partner, not just the kids but the partner. Peter Levine: Oh, I see. I didn’t know what an Oriole moment is back then. Neil Sattin: If I can say, “Code Cardinal,” then the other partner, “I would love to hold space for you right now. I would love to just hear what’s going on with you.” Then – takes a little bit of the edge of. Peter Levine: Yeah. I think that’s an idea. I think that’s a great idea. I know some couples, when the other couple is really like anxious and getting ready to, in their perception to snap at them, I had couples that just say, “Eggshells.” That’s it, and often, they laugh together but not always. You’re concerned. You’re noticing that you are walking on eggshells. Maybe that’s useful. Peter Levine: Resilience, of building resilience. It doesn’t happen all at once. It doesn’t always seem to happen “increase, increase, increase” because sometimes, you’re feeling more resilient and then, something happens and it feels like you’re less resilient. But the overall movement is towards greater resilience. Again, I think that’s just part of how we are built. That’s part of our evolutionary advantage, is to have this kind of resilience. Neil Sattin: Right. And yet so often, it doesn’t happen. People do get stuck in trauma or couples get stuck in a pattern of how they interact with each other. I’m curious getting back to our example of the husband who comes home, the partner says, “Could I hold some space for you?” What’s likely to happen next? Peter Levine: Well, let’s say a favorable outcome what I’ve seen many times. Again, let’s just say it’s heterosexual couple. The husband is coming home and he’s obviously activated. Just by being there and being present and saying, “I’m here,” saying it verbally and non-verbally, “I am here. I am here for you.” Often, the tears will just start flowing from the spouse’s eyes, from the husband’s eyes, tears of relief and tears of gratitude. And that’s another part that’s really important in resilience, is not the belief in gratitude but the inner experience of gratefulness, of gratitude. Peter Levine: Again, that’s something that we can cultivate together because it’s really what we want. We don’t want to be angry and withdraw and isolate ourselves and become more angry. We want to be able to move through it. If people are in a relationship, they’re committed to a passionate relationship. If you are committed to that, then you have to be able to work with these difficult emotions. Otherwise, there won’t be the passion. The passion will die as these emotions get more and more suppressed. Peter Levine: Tears, even sometimes, you’ll see shaking and trembling and spontaneous breaths. Sometimes, there’ll be even, of course, sobbing. When they’re sobbing or even when there’s just the tears, very often if the spouse or the partner says, “Can I hold you?” Or, “I’d like to hold you.” And they give some kind of a non-verbal cue that it’s okay, just holding the person when they’re in that emotional pain. God, how liberating that can be to be literally held? Neil Sattin: Right. And this really challenging because sometimes when your partner is in pain, it’s hard to know, like to know what am I supposed to do in this moment. Being willing to make an offer like that. How would I know if I’m holding space for my partner and they’re crying and shaking, like how do I know if everything is okay versus like things are not okay? Peter Levine: Then, to be held … Because almost all of us who have been traumatized have not been held in those critical times when we should have been held – but it’s never too late to have a resilient childhood. It’s never too late to have a happy child because the child not only lives within us but that child’s ability to rebound, to be resilient also lives within us. Neil Sattin: Yeah, and I’m wondering, what does it look like? Like how do these things … How would it typically resolve? Because I think one thing that a lot of us can feel a lot of fear going into tears and I want to offer this because if you’re listening to the show, and maybe you’re thinking like, “Oh, God, I got some tears to shed,” or like I want you to have a sense of, that there is another side like what does it look through when you get through the tears? What does it look through like if you feel yourself starting to shake? What’s on the other side of the that and how do you know when you’re getting there? Peter Levine: Yeah. Again, almost any sensation where the person … It’s in a safe enough situation and the person is able to stand back enough to observe them. I can barely ever think of a sensation that didn’t become more good, more glad, more whole. It’s just our nature, and it’s a skill. You have to practice. It doesn’t happen all at once, so a couple shouldn’t feel frustrated if it doesn’t work at once. And if the spouse that’s in the distress barks at you, just to feel your own body, of course, and remind yourself that you’re not the target, that they’re angry at somebody else. Peter Levine: And then again, sometimes, the partner will say something like, “Maybe it seems like you just want to be alone right now, and if you need me, I’m here. And so, let’s just talk a little bit later,” because again, a lot of times and again, I know this is like stereotypic but it’s also true. A lot of times, the men don’t want to deal with it then. We need some more time just to be with ourselves and then we can reach out for support and help. It would be great if it didn’t happen that way, that we’re always open to support but we’re not. We’re not. We need also to acknowledge and respect that. 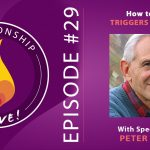 Peter Levine: Again, to know because if you have … As your relationship grows and as trust continues, those skills really build. And I’ve seen clients, where they’re just really angry at each other at one moment and then boom. They’re in love with each other again, and again, and again. It does take practice. It does take appreciating that nothing is going to happen perfectly. Nothing is going to happen all at once. That it’s a gradual process of deepening as relationships are about deepening the connection and deepening our skill to be with ourselves and to be with the other. Peter Levine: Well, that’s usually after you’ve gone through first the bodily reactions. Peter Levine: The crying, the shaking, the trembling, the spontaneous breaths, and leaving time for that to settle. And then, I know a number of parent who told me and say that happens like just before dinner. Well, then they’ll have the family dinner together and then afterwards to sit by the child and say, “Wow, you know, when you fell off your bicycle, that really scared me. God, I bet it really scared you. Do you remember? Do you remember what it was like to fall off?” And then the child, if they want, can then start talking about the content of how scary it was, about how they couldn’t get their breath, but then they could get their breath when they were crying just then. Peter Levine: Yeah, it’s fine to talk about it but again to at least separate it in time with moving through the shock part of it and moving towards a more beneficial sensations, more supportive sensations. Neil Sattin: And by being there, it initiates the process. I think this is what you’re talking about that by attending to that sensation, there’s a natural mechanism at work that invites it to evolve to a place of release, which is going to feel good in the end. Neil Sattin: Right. What I loved too is you talked about the importance of time in between questions, so when you’re asking like what are you sensing or what comes next to just leave space there. Peter Levine: Yes, that’s right. Adults tend to be linear time, this, then that, then that, then this, then that, then this, then that, like a long straight trajectory. Kids don’t do that. They’re much more with what the so-called aboriginal people called circular time. And children are like that. They get up in the morning. They have their breakfast. They go to school. They come back. They have milk and cookies, milk and Oreos. They go out and play. The parents call them for dinner. They come and they eat. They play. They go to sleep. They wake up. They get dressed. They have breakfast. They go off to school. It’s a very different relationship of time. It’s a much more right brain way of relating to time. Peter Levine: Yes, adults will often tend to rush things when you need pauses, and the children will give you clues about that. One of the case examples I give or the examples I give in Trauma-Proofing your Kids is a play where with Sammy who had a fall, cracked his … had to go to the emergency room for stitches and so forth. And then, we were playing the game of rescuing Pooh bear. Pooh bear was in the hospital. Each time, he would give us very clear signals of what he needed then, and our children give us these cues if we’re paying attention. And in order to pay attention, we have to be able to be relatively comfortable within ourselves. Again, this is something that the parents can practice with each other, and it just spreads to the child, and it spreads to the child’s playmates, and it spreads to the whole village as it were. Neil Sattin: Peter, you’ve been so generous with your time and your wisdom as before. I have one more question for you, if you don’t mind that, that just sprang in with what you just said, which is … For one thing, I’m impressed by your faith in our ability to heal, to get to a place of goodness and wholeness. And what you said about the children, that they can communicate to us exactly what they need if we’re willing to pay attention and offer space. And I’m thinking as an adult, how do we recognize the signs within ourselves of what we need in a given moment? Peter Levine: Well, that takes practice because again, when we’re in a scary or a vulnerable moment, our early pattern may be to withdraw. But again, we can unlearn that and learn new ones. When you talk about faith, well, I guess I could kind of relate to that. I could relate to that, but it’s also 45 years of experience in seeing this happen thousands of times. Peter Levine: I guess I know it because of experience. I guess if you want to call that faith, okay, we have to call it faith, but it’s just … The human being never ceases to amaze me. I think we’re all like this meadow of different colored flowers, and there were all moving from our roots to our stems, to the flower, to the bud, to the flower and opening and opening and opening. And I think opening is basic human need, a basic human drive. Peter Levine: I think Anais Nin said something like this, “When the pain of tightening into a bud becomes more than the pain of opening as a flower, then we will open.” And there’s some truth to that, of course, but I don’t think it’s just pain that brings us towards opening. I think it’s just this innate capacity, the desire to open, to be fully alive, to be able to say, “I’m alive, I’m here, I’m real. I’m here, I’m alive and I’m real. I’m alive and I’m here.” That’s what everyone wants. Peter Levine: Again, faith, it’s observation. I was trained as a scientist and a lot of that is about observation. Yogi Berra said it this way, “You can observe a lot just by watching.” And I would say that. Again, in the book, we give a number of different exercises for the parents to help them get more in contact with their inner sensations and their own resilience. Neil Sattin: And I would like also, following on your metaphor, I would love for this conversation to plant the seed, that pain isn’t required to get you to this place of blossoming. That knowing that it’s possible to blossom will hopefully help you invite your partner, invite your children, invite yourself into that experience. Neil Sattin: Well, Peter, thank you so much for being with us today. Your books, Trauma-Proofing Your Kids, Trauma and Memory, Healing Trauma, Waking the Tiger, so many classics that are just completely inspiring, both in the level of recognizing what’s possible but also understanding what is happening within us and in the world around us. It’s such an honor to be able to talk to you and to share your work with the world. Neil Sattin: As a reminder, if you want the show guide and transcript for today’s episode, you can visit neilsattin.com/levine, as in Peter Levine. You can also text the word passion to the number 33444 and follow the instructions. And we will have links as well to Peter’s work, to his books. Peter, what do you think is the best way for people to find out more about what you’re doing in the world? Is there a particular website you’d like them to visit? Peter Levine: Yeah. There’s the website of my training institute. It’s http://www.traumahealing.org. And there are lists of therapists and you can find that, for example, therapists that specialize with children or with relationships. And then I have a website with different information of where I might be giving a public lecture or something like that or some videos that are available. That’s http://www.somaticexperiencing.com, or dot org, I think. Peter Levine: Yeah, you can get material there. And apparently, although, I’ve never seen them, people tell me there are a number of interviews or lectures that are available on YouTube. So, I guess if you just YouTube my Peter A. Levine, it will come up with a bunch of stuff. Peter Levine: And it’s delightful to talk with you again, Neil, really. I so much appreciate what you’re doing because really we are designed to be in relationship, and to keep our relationships alive. That’s the real task. It sure is for me. Okay.